If you always do what you've done, then you'll always get what you've always got. Lynton grew up on the family farm at Strathalbyn and having always wanted to be a farmer took the opportunity to follow his dream as opportunities presented themselves. 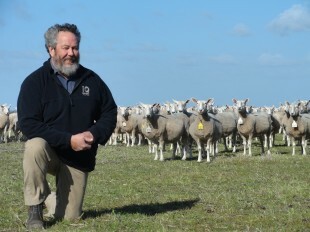 He made a gradual transition over 40 years from being a continual cropper with only a few stubble lambs to now being a grazier growing a few stubbles for lambs. It seemed to be a natural progression as the stud became more successful. Lynton was Chairman of the Australian Border Leicester Association from 1995 -2000 and was also a foundation member of $uperBorder$. He has also been selected to be a representative on a number of industry committees, was awarded a Nuffield Scholarship and has received awards for innovation and in recognition of the achievements within the Inverbrackie Border Leicester stud. His main focus at the stud is genetic improvement of each generation, seeking new information, as well as day to day duties involving caring for the sheep and maintaining the property.